OOoooooooh I like this. I have the little 2 and 1/2 inch version of this guy from waaaaaaay back and would loooooove to add this to my collection. 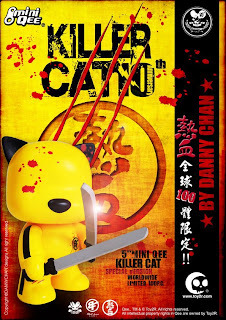 This is Danny Chan's Killer Cat Mini Qee from Toy2r and I need one. The main problem I have is that there is only 100 of these out there and they are going to be released this week at the Taipei Toy Festival in Taiwan. I'm no geographical scholar, but I'm pretty sure it's not just off the New Jersey Turnpike. That, my friends, is what eBay is for.